You must make reservations at least 5 minutes in advance of the time at Pontoon St Kilda Beach. Sand level, Stokehouse Precinct. Fast moving, casual & affordable. 18m Bar. 4m Grill. 350 Seats. 40 speakers. DJ's. Beachside deck. Great views, modern vibe, food was good, ( roast chicken) and waitress was lovely. However once our mains were done, service was done. No one offered coffee, dessert etc, so felt a bit abandoned. Also bench seating cushions are a light color and look very, very grubby. Other than that, good choice for lunch with friends on a lovely day. 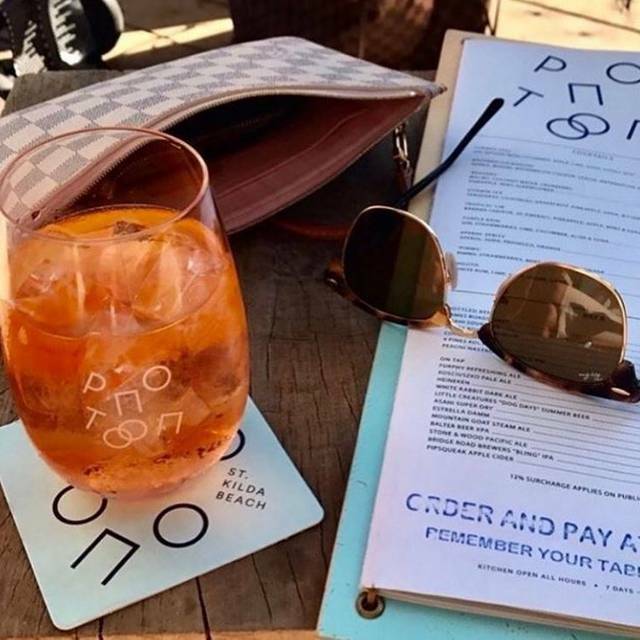 Pontoon, The Stokehouse's baby sister is a great place for a casual meal or quick drink. With fabulous views of the bay, and seats that touch the sand you really get the St Kilda vibe. Meals are reasonable and the service was spot on; much more in line with the upstairs dining. The menu is not extensive, but has some interesting foibles and everything we ordered was just great. I'll be back, and recommend this to my friends! Outstanding quality delivered with efficiency and charm. Big bold flavours from the grill, and very affordable. Inclement weather wasn’t an issue - warm and welcoming throughout. Best location in St Kilda. We have really enjoyed 2 family dinners at Pontoon. The food, service and views were great. We are planning to go back for breakfast or brunch on the weekend sometime. all the food was lovely we desert unfortunately the churros weren't nice at all too much sugar and not tasty at all, so we left them ..
Great food and service. Good wine knowledge by waiter. Thanks for a great evening. the pork we ordered is bit over cooked, so the meat is dry not juicy, we also ordered the whole flounder fish with pea&bean on top, I like the tasty of source, very fresh and vinegary . Sadly we were seated near a screaming baby and a group of young Mums talking at the top of their voices. The small area set aside for bookings did not allow us to move. The space was very beautiful. Very st kilda feels to it. I have to admit that I was not expecting a lot for food to be amazing, giving past experience dining along the beach, most places either very pricey or not worth the value. But Pontoon, really have lifted the game. We ordered special roasted chicken and it was STUNNING. I'm a sauce girl, but I did not need sauce with that chicken at all. The pizza was also very very nice. Great portion, not too big not too small. The service by the manager and waiters at pontoon was amazing. There was a mix up with the booking that was not their fault and they made sure we were accomodated even giving us free drinks as an apology. We were constantly checked on and served with such friendliness and professionalism. Stunning views, fresh and tasty food, great service! Great lunch venue tasty food and exceptional service! Location is fabulous! Venue is spectacular and to be honest, the food and experience downstairs was far superior to the fine dining upstairs. Staff were friendly and knowledgeable when we could get their attention. Despite dining for hours we had to constantly flag them down to order more drinks (water and wine). I also over-ordered for the first time in years - usually staff advise on the right amount for the table and whether I'm ordering too much, or advise to order a certain amount and come back for more later. Overall, the experience was great, thank you. Food was fresh, inspired and plentiful :) It would've been nice to feel better looked after with more attentive service, but otherwise, it was great. Good place, good food, nice staff. Recommended for gluten free food options - being a coeliac I was very surprised at the number of options I had. Great place for summer drinks. Highly recommend Pontoon, from the food to the staff, outstanding. Only thing that astounded us in such a beautiful venue was no sun blinds as at sun set in 30 odd degrees you are roasting inside. Food for thought Pontoon. Spent a very pleasant couple of hours here with two old work colleagues for lunch. Great food and view. Would recommend it. The noise level was not energetic ( the highest rating) it was distracting and unpleasant. There were several groups in the restaurant and so we were unlucky with timing. When we requested staggering the dishes they explained that dishes would come as it suited the kitchen. There was four of us that had a business lunch and three felt unwell after the meal. Very disappointed with the quality of the food and service. Would not recommend except for the view. Staff were great, they dealt with our requests easily. Food was lovely for a larger group, suited everyone. I always love going to Pontoon. Very experienced friendly staff, fabulous delicious food, wine and position. Always sit where the comfortable couches are makes it very relaxing and comfortable , never want to leave ! Lovely staff and great food and wine . Good for all occasions and this was a catch up with an old friend. It’s my third visit and never disappoints. The meat which 3 of us had was excellent but there was little choice for our vegetarian and the swordfish burger was rater dry. The Stokehouse Group has their act together and since reopening have been epic. While PONTOON used to be bar service, now they take reservations and table service and the food is fantastic, large portions, very reasonably priced (esp as the upstairs fine dining is commensurately priced for the higher end market though totally worth it) and service was GREAT. There was dance music at quite loud volume on the Friday night and we'd not expected that----and that wouldn't have been our choice had we known about it (never having been there on a Friday or Saturday night downstairs) but it was vibrant. Just a bit too loud for dining for easy conversation. This place will be a staple for the beach for years to come for casual dining. Wish they had their ribs though that they featured when they opened but they have a great rotisserie special each week. 10 out of 10 except for the music was a notch too loud during dining time...for us anyway so it's subjective. Casual Birthday Lunch with my daughter on a cold windy Monday. Food delicious. I had Tuna Ceviche and baby Barramundi and my daughter popcorn chicken and minute steak and a side of quinoa Freekeh Salad. Service excellent and friendly. Cocktails great. Really lovely setting and we both thought excellent value. Highly recommend and will definitely return. Thank you. The 'old' Stokehouse downstairs set-up was better. Pontoon felt cluttered, noisy and crowded at 5pm on a Sunday. Menu choice was uninspiring; fish and chips unavailable; swordfish burger rather tasteless. The entrance from the street side was initially not easy to find - not very welcoming. All in all the new building and Pontoon is disappointing. The last time I visited Pontoon, I couldn't fault it - food, service, drinks everything. This time was below average and it looked like a lot of tables were experiencing the same problems as ours. Not sure if it was understaffing that was the issue or that the staff as a whole weren't proactive enough to fully understand diners' needs. It took ages to get our waitresses' attention to get our first round of drinks, then they took a long time to arrive. After we'd been there for at least 3/4 hour we finally got to order our food. Our waiter valiantly tried to remember our order (table of 4) saying he didn't have a pen (um, why does a waiter not have a pen?) but didn't go and get one - and of course, one of our meals was forgotten. Three meals came out and we waited and waited until our food had cooled considerably before someone even came to see what was going on. Then we had to wait a further 20 minutes while they cooked our friend's dish. We had all eaten our food by the time hers arrived. Awkward and annoying. When we had finished our bottle of wine it took at least 15 minutes to get someone's attention so we could order more. One of my friends was so annoyed she gave the maitre d' a blast and he argued back with her that they were so busy. Last time I heard, the restaurant being busy shouldn't be our problem. It was a rare sunny Saturday May afternoon in Melbourne -and guess what? People want to get amongst it, so you're going to be BUSSSSYYYYYY!!!! As this was a long lunch, there were so many missed opportunities for Pontoon to upsell us on more drinks and food. Their loss. We all loved the food and the service. However trying to find the building was difficult- there is no signage out the front of the building- so not surprising that the car parking spots were empty- we parked in the pay car park across the road which was not cheap and most annoying- please put some sort of sign up so people know where Pontoon is. Food was so delicious. Waitress was really upbeat, warm and helpful. It was delicious and service was great! Will definitely be back! Great Tuesday pizza special. Food good for sharing. Will look forward to next visit. We really enjoyed our dinner at Pontoon on Fri night 9/3. The food, wine & service were all exceptional & represented great value. We were most impressed seeing our name on a reserved table for 2 after making the booking online.